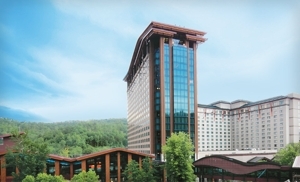 Harrah's Cherokee Casino & Hotel - 1 Night Stay & $30 Resort Credit Only $69!!! Tons More Offers!!! Groupon has got an awesome deal for Harrah's Cherokee Casino & Hotel! You have 3 packages to choose from. There are tons more offers for other places also! For more information and to get yours - Click Here to see Groupon Getaways !